Did you know that on average it takes a recipient of inheritance 19 days until they buy a new car? What are your thoughts on whether this a financially-savvy way to spend an inheritance? In our busy lives talking about money with our family members may prove to be a daunting and sometimes an emotional subject to bring up, especially around the dinner table. We may think that if we do not disclose our wealth we will encourage hard work, and by putting our chips on the table our family may start to become lazy and entitled. Avoiding a conversation about money may have us running the risk of us not passing on the knowledge and wisdom gained in our life time, and the financial literacy skills that we have learnt through our own experience, self-education and the help of our professional advisers (financial adviser, accountant and solicitor). Before we go any further, what is financial literacy? Broadly speaking, financial literacy ‘is a combination of financial knowledge, skills, attitudes and behaviours necessary to make sound financial decisions, based on your personal circumstances, to improve your financial wellbeing’. Keeping track of finances; approaches to managing everyday expenses. Planning ahead; planning for the medium and longer term, including for your retirement and beyond. Choosing financial products; and understanding and assessing different investment options and their underlying risks. Staying informed; use of information, tools and guidance when needed. Financial control; savings behaviour and managing debt. So, why might it be important to pass on your financial literacy skills? According to Roy Williams, Founder and President of Williams Group*, the statistics are less than rosy when it comes to looking at what happens to the wealth that one day will pass from you to your family via your estate plan; roughly 70% of wealthy families lose their wealth by the second generation, and a stunning 90% by the third*^. While you may not consider yourself ‘wealthy’, it is still important to reflect on the two key reasons that were found to be behind these high percentages; a lack of or low levels of financial literacy by the second and third generations, as well as trust and communication breakdown among family members. 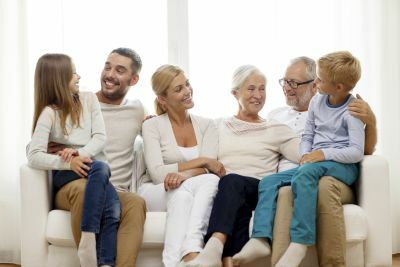 With this in mind, there are several things that you can do to make sure your family are financially-savvy and work together now and when the time comes to receive their inheritance. Start by sitting down and having an open discussion about the money that is expected to flow through to them, how you came to accumulate this wealth, the strategies that you have employed to build and retain your wealth (throughout your working life and retirement years), and any expectations that you might have around the use of your assets in the future. Suggest that adult family members seek professional advice about their existing circumstances. A professional adviser can put them on the path to understanding their current financial situation compared to where they would like to be in the future, and how best to handle receiving a future inheritance. Financial literacy is important for both you and your family members. Think about the impact financial literacy’s absence and presence has had on you as you have navigated your way through the world of personal finance in your lifetime. It’s interesting to note that when asked why he was leaving the majority of his wealth to charity, Billionaire Warren Buffet explained that he wanted to leave his children enough money so that they could do anything, but not so much money that they did nothing. *Over a 20-year period, Roy Williams and his associates interviewed 2,500 wealthy families who had gone through estate planning and wealth transition. *^Williams, R., & Preisser, V. (2010). Preparing Heirs: Five Steps to a Successful Transition of Family Wealth and Values. Robert Reed Publishers.